JOSCELYN REED: I had an incredible teacher in the third grade, Ms. Freeman. She was the first teacher that made learning joyful and fun. I felt like I was seen and respected in her classroom. That, coupled with a giant jar of lemon drops she kept on her desk as her reward system, made me want to be a teacher. I tried a few different areas of study, psychology and sociology, before stumbling back into education in college, but the seed was definitely planted in the third grade with Ms. Freeman. THE 180: What brought you to Turnaround for Children? JOSCELYN REED: After being in the classroom and then becoming an instructional coach, I felt an urge to follow my passion to support teachers to develop a positive culture and climate in schools. 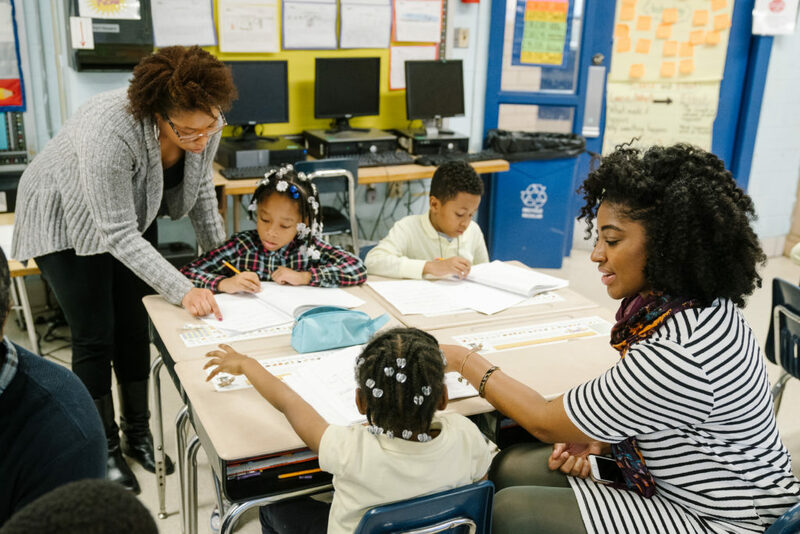 Teachers generally have so much on their plate, especially in low-income and high-poverty urban areas. I came across the work of Turnaround for Children and fell in love with the infusion of brain science and trauma research with what I later realized I did naturally as a teacher and coach — I just couldn’t name the science at the time. The work is important and impactful, and on top of that, it is supported by science, which feels great to share. THE 180: What do you think is unique about the way Turnaround works with educators? JOSCELYN REED: Turnaround creates many opportunities to get in front of audiences of educators and share our stories and perspective of being a positive influence in a child’s trajectory and survival. When I share my story with educators at my sessions, I also clue them in on the fact that this is the mindset training that I wish I had my first few struggling years of teaching, but it will be a journey in shifting your mindset to be inclusive of what a student shows up to school with and how to best support them. It doesn’t magically happen overnight after one professional development session, but once you know how the brain and body works with behavior management and stress, you will never look at a student that is having a hard time in the classroom the same way. It takes practice, managing our own emotions and reactions as adults, showing up for a child in need of support in the moment, and making this new knowledge a consistent reality in the classroom and the school. THE 180: You recently assumed a new role as Leadership Development Coach. How does this role differ from your previous role as Instructional Coach? JOSCELYN REED: This role mirrors the shift in Turnaround working with many principals and school leaders in D.C. Instead of working within schools every day, I work to support the partnership directors in building content for facilitation and creative projects around our science perspective to help best engage educators with our content. I also get to lead many professional development sessions myself with teachers and school leaders, which is one of my all-time favorite things to do. I can barely contain my excitement to share my story and the science when in front of a group of educators that is eager to learn. It’s the best! THE 180: You were a teacher at Friendship Public Charter School for six years and were named 2015 Teacher of the Year! In what ways does your background in teaching help the work you do here at Turnaround? JOSCELYN REED: That achievement was one of my proudest moments! My start in the education field was surprisingly rocky, but other teachers I met at Friendship Public Charter School became my real friends and they taught me to be persistent and stay true to what I love to do. I realized I am good at teaching, but at the time I was not good at connecting with my students. You can’t teach a child how to read unless they are invested in you as their teacher and the environment you created with the other students around them. I went to school for education and served students in affluent neighborhoods for my first teaching experiences at Seton Hall University. I realized very quickly that my teacher training, while I felt like I mastered content, neglected to teach me about students that come to school having had traumatic experiences and what that meant for their potential actions in school. I thought I knew what I was doing and on paper had the pedigree to be able to do it. I couldn’t have been more wrong. There are specific training needs for teachers blessed to teach and support students from communities experiencing high crime and other challenges. I made a shift in my teaching style to include Whole Brain Teaching techniques and luckily it worked wonders for my students to become comfortable and thrive under my care. At Turnaround, I gained further experience with students, schools, and communities that need the most support. I am committed to making sure that educators in the lives of children are mindful of their impact on their students’ development and in turn are inspired to provide the most loving and appropriately challenging social, emotional, and academic support to every student in whatever way they need. JOSCELYN REED: Confidence. These days students are regularly facing multiple moments of oppression. That has the potential to make them feel like they are less than capable of achieving greatness if they don’t have adults that teach them that they are supported as they try, fail, and persist through challenges. The only guarantee our students get is that there will always be another challenge to overcome. My hope is that students are acquiring the ability to clearly articulate their opinions with respect to their peers and teachers. They are learning how to agree with sentiments that resonate as well as respectfully disagree with those who oppose their beliefs. This looks like a student confidently answering a question in class and once they are challenged by their teacher on their thought process, they don’t change their answer. They instead lean into the discomfort and push to elaborate their stance. Students will be questioned time and time again as they grow older. The benefit is preparing them now for those moments. No matter how difficult it may be, they will have the capability to speak from their heart and back it up with facts. With technology advancements and social media, the skill of intentional dialogue is becoming less practiced. I hope that students are confident and skilled at sharing their perspectives with their voices just as comfortably as they are typing them. Evidence of this is when our students end up passionately and courageously advocating for their rights on the steps of government buildings, in the middle of the road or in their own homes. We teach them accountable talk and then they go confidently speak about holding others accountable for justice in our communities. They see the power in using their voice because their confidence has been carefully cultivated by adults that care about them. THE 180: What do you hope for your own child, Zaire? JOSCELYN REED: An educational experience that extends beyond subject content and into the development of his passions, character and advocacy. That would support his best self being seen, heard and felt by all that know and love him. THE 180: Is there anything else you’d like to add? We support students in finding their purpose and passion, nurturing it, and then recognizing that it is a journey. They certainly will fail at some point. It is what they do next that defines who they are and how great they will become. If students know with certainty that you are committed to not allowing the barriers to inhibit their ability to maximize their learning opportunities, persistence will become an inherent tool in their toolkit for the rest of their lives. Students can embrace the humble beginnings in which they may have started and rise to the challenge of overcoming those difficulties by being intentional about their contributions and effort in the classroom. As educators, we know that greatness requires patience and with time greatness becomes personalized.